Special precautions are necessary onboard a chemical tanker during loading and discharging of various grade liquid chemicals. Prior to loading the relevant tanks and associated loading equipment must be checked for technical readiness and their acceptability for the next cargo. 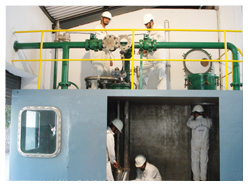 Visual inspection of the tank, tank openings, and equipment has to be carried out Various tests / checks have to be carried out of the manifold and cargo system to ensure their correct lineup and readiness. For gauging e.g. ullaging and sounding closed devices must be used. The level alarm systems must be operated during the entire closed cargo operation. Closed cargo operations must be stopped as soon as any essential system for safe loading or discharging becomes inoperative. Sampling to be carried out with closed sampler whenever possible. 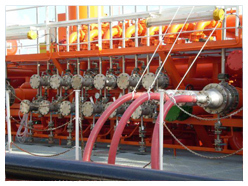 When more than one grade of cargoes is loaded, use of same sampler for different grades will contaminate the cargo sample unless the sampler has been thoroughly cleaned. Controlled venting must be established if closed cargo operations are required. A controlled tank venting system is a system with pressure and vacuum-relief valves (P/V-valve) fitted on each tank in order to limit the pressure or vacuum in the tank. The P/V valve should operate in such a manner that neither pressure nor vacuum is created in the cargo tank during cargo operations that exceed the tank design parameters. Secondary venting system must also be operational Information on maximum loading rates and venting capacities is to be readily available and displayed in the cargo control room. Vapour return should be used in accordance with IBC code, local, terminal or customer's requirements. Very toxic and volatile cargoes should, if the shore is equipped with a vapour return, be loaded with vapour return in order to avoid vapour release into the atmosphere. VECS manual must be complied with. 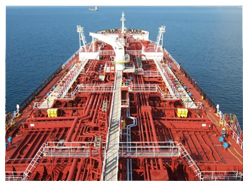 This course is for All Deck Officers on board chemical tankers for the cargo handling in port and care in transit. Manual and other cargo documents.